Mojo's really happy that Ela's back. When she came in, he jumped all over her and licked her for 5 minutes :) He was so excited she was home. One funny side-effect of Ela's return is that he doesn't try and sleep on the bed anymore. It's not that there isn't enough space, so maybe he knows it's just not his place? Who knows. Yesterday was his nine-month birthday, so we gave him a beef bone. Wow, he really chowed on that thing, and got oil, etc all over himself. Bath time! It's always fun giving him these kinds of treats. I'm sure he has no idea why he gets these sometimes, but he doesn't mind at all. Ela deemed the boots too big. They keep falling off, so we should have gotten the smaller size. Oh well. It's funny, when Mojo wore them he'd run, because he knew that if he ran enough they'd fall off. And sure enough, they did. He sounded like a little horse, clip-clopping around. We also went to Petsmart yesterday, where a woman said "he acts like a havanese, but doesn't look like a havanese." The short hair threw her off, apparently. Mojo also was pretty good with petting, in that he didn't jump up on the kids and most of the adults who wanted to pet him. Oh, we're trying to teach him how to squat, like a squirrel does. Squat means sit vertically, with your hands out, like a squirrel looking around. It's pretty obvious that Mojo has no clue what we're trying to get him to do, but we'll figure out how to get him to do it. He keeps wanting to stand up instead of just sqatting on his haunches. Maybe the position is unnatural? Who knows. Mojo's 15 lbs as of a minute ago or so. He's 9 months tomorrow...amazing! 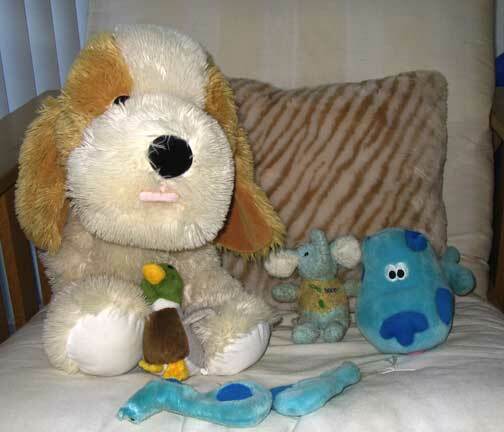 Middle row, L to R: the Potato, the Duck, the Booda, and Blue. Front row: Blue's ears, which were liberated a few days ago. Whoa, I can't believe I just saw that. Mojo was up on the desk, then lifted his tail and farted (with a little honk, no less). Wow! I feel like I've just witnessed some kind of secret dog ritual. Or something. Ela comes back tomorrow night (finally!). Wonder what Mojo'll do when he sees her? I think he'll be shaking like one of those vibrating hotel beds. She'll be getting in late, maybe I'll throw him in daycare so he can burn off some energy. Hmmm. Nothing much to report on the Mojo front. But I was thinking as we were in the park today, if each of his years is 7 of ours, does that mean that each day is about a week for him? What does that mean? Does that mean that the 1 minute he spends pooping is like 7 of our minutes pooping? I guess that 7 year thing is more of a relative lifespan? it's funny how Mojo behaves when he has to think hard. Yesterday I threw his duck behind one of our armchairs. The only way to get to it was to crawl under the armchair and around the back. He was, well, trying almost everything except that in a valiant attempt to extract the duck. The armchair has a wood frame, so he could see the duck, but he couldn't get to it. He went around the left side, but it was sort of blocked off. He went around the right side, but he couldn't see the duck, so he didn't go all the way through. He tried going right under the chair, but he couldn't quite reach it. Eventually, I pointed him around the right side, and after much barking off he went to get the duck. Then I threw the duck over there again, just to see if he remembered how to get it. Yep, he did! What's great is you can see his mind cranking away, trying to figure out stuff. I wish there was more stuff like that we could do, but retrieving seems to be the easiest way to tax his brain. Or, well, retrieving stuff from hard-to-reach places taxes his brain.